Don’t get me wrong—Chicago’s already a terrific place to ride a bicycle. It’s flat, with a bike-friendly street grid and a scenic, 18.5-mile Lakefront Trail. Since the early nineties, the City of Chicago has spent $100 million to push pedaling, striping over 110 miles of bike lanes, installing more than 12,000 bike-parking racks, and educating tens of thousands of people about safe cycling via Mayor Daley’s Bicycling Ambassadors. Cyclists have access to buses and trains, we’ve got a fancy bike station in Millennium Park, and the list goes on. But when Newcity asked me, a former Active Transportation Alliance staffer and consultant to the Chicago Department of Transportation’s (CDOT) Bicycle Program, for my take on the current state of bike culture in Chicago, one word sprang to mind: stagnant. On some levels things are going great. Since changing its name from the Chicagoland Bicycle Federation, Active Trans has been doing yeoman’s work building a coalition of biking, walking and transit interests. This has helped double the organization’s budget and staff size, increasing its clout to promote green, healthy travel. We now have four community bike centers spread from Woodlawn to Rogers Park, most teaching bike handling and mechanical skills to inner-city youth and selling refurbished rides to residents for cheap, green transportation. Three of these co-ops have expanded to larger digs in the last year or so. There are now three Euro-style bicycle shops selling stylish, practical city bikes and cargo cycles, plus a gaggle of other new stores serving the ever-expanding ranks of daily commuters. After all, CDOT says bike traffic has quadrupled on Milwaukee Avenue over the last six years. The Chainlink, a social networking site for Chicago cyclists, has ballooned to almost 4,000 members in just two years. There are now a multitude of two-wheeled subcultures in this city, some of which I’ve probably never even heard of. Why, only yesterday I heard the term “Tarck-ing” (fixed-gear, freestyle trick riding) for the first time. But lately CDOT and other city agencies have been spinning their wheels when it comes to making bicycling safer, more convenient and fun through innovative bike facilities and programming. To paraphrase Daniel Burnham, they’ve been making little plans that have no magic to stir cyclists’ blood. 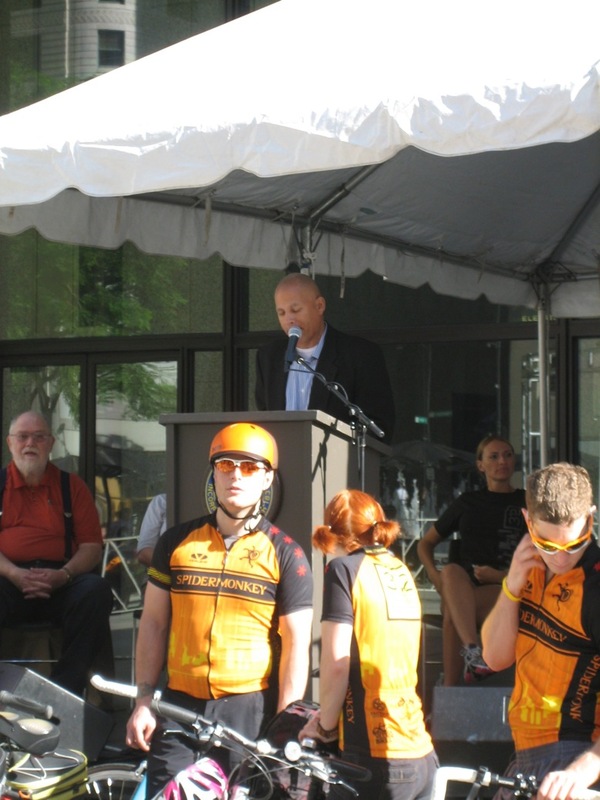 This current leadership vacuum was apparent at this year’s lackluster Bike to Work Rally. Mayor Daley, who usually shows up to give an enthusiastic if somewhat cryptic speech at the annual rally, was conspicuous by his absence. CDOT Commissioner Bobby Ware, subbing for the mayor, seemed to know little about his agency’s bike projects. He spoke with his nose in his notes, referred to the City’s Bike 2015 Plan blueprint for cycling as the “2010 Plan,” and mangled the name of a Bicycle Program staffer who accepted an award on behalf of the program. In fairness, Ware’s only been on the job for a month. But the fact that CDOT has had five commissioners in six years, for reasons known only to Mayor Daley, has slowed the pace of bicycle planning. Each new commish has to be brought up to speed on cycling issues, and this wastes precious time. Another speed bump to better bike facilities and events has been the city’s reluctance to put some skin in the game. Daley, rumored to be a cyclist himself, is often cited as the U.S. mayor who is most outspoken in support of biking. And as a powerful politician, his lip service is in fact crucial for motivating bureaucrats to support bicycle projects. But like our under-funded transit system, bicycling gets almost no money from the city budget. Virtually all of the cash CDOT spends on bike initiatives comes from federal and state funds, often through federal Congestion Mitigation and Air Quality grants which come from a tax on gasoline. This stinginess makes it harder to pull off bold schemes like the “ciclovia,” an event that shuts down several miles of streets to cars, creating safe places to bike, walk and socialize. Active Trans first proposed bringing this Latin American concept to Chicago in the early 2000s, well before other U.S. cities were talking about it. But City Hall’s insistence on a heavy police presence and reluctance to foot the bill delayed the program for years while Active Trans struggled to raise the necessary funds. The ciclovia finally debuted in 2008 as “Sunday Parkways,” with events on two different 3.5-mile courses on Sundays in the fall. 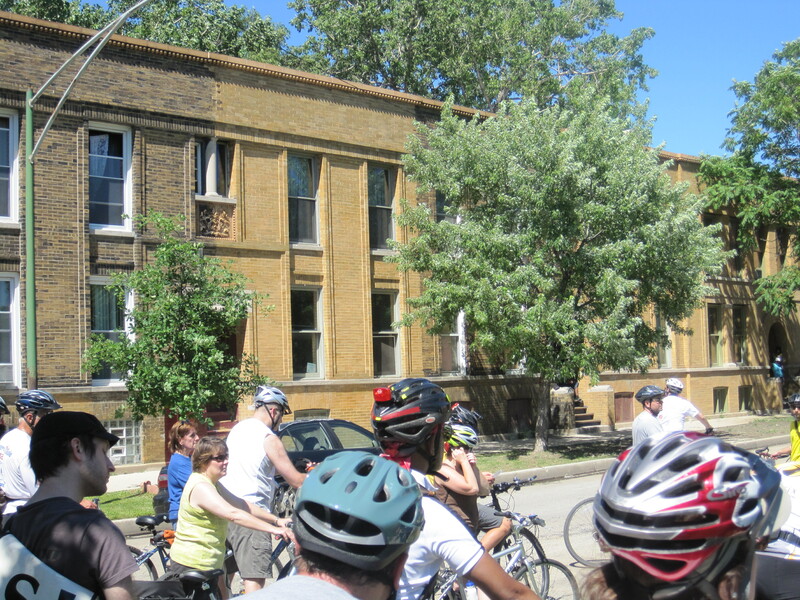 In 2009 it was consolidated to one seven-mile summer Saturday event, called “Open Streets.” After these modest successes, the program fizzled out due to the difficulty of funding it—there will be no major events in Chicago in 2010. Meanwhile, city-funded ciclovias have flourished in other cities. New York is staging three this year, Portland, Oregon is staging five, and San Francisco is staging nine. Chicago used to be the poster child for big-city bike improvements. A few years ago, New York’s Transportation Alternatives advocacy group liked to use the Second City’s successes to shame the then-sluggish New York DOT into action. But things changed in 2007 when New York got a dynamic, bike-friendly new transportation commissioner, Janette Sadik-Khan. In recent years Chicago has fallen behind New York and many other cities in several aspects of promoting cycling. Chicago has installed more bike racks than any other U.S. city. But last year the City began uprooting most of Chicago’s parking meters to make way for pay-and-display units, eliminating tens of thousands of de facto bike-parking spots. Meanwhile, CDOT has not installed any new bike racks for months and will not be doing so anytime soon, due to installation contract delays. On-street bike parking, where a single car parking space is filled with racks to accommodate a dozen cycles, reducing sidewalk clutter and advertising the space efficiency of bikes, is becoming commonplace in Portland, Oregon and San Francisco. Although Andersonville’s Cheetah Gym, with the blessing of the local chamber of commerce, asked for on-street racks several years ago, CDOT passed on this opportunity, citing concerns about safety. Chicago still hasn’t tried on-street bike parking. Millennium Park’s $3 million, state-of-the-art bike station opened to fanfare in 2004, but the facility is too far east to be of much use to most Loop commuters. The Bike 2015 Plan calls for building a second bike station in the West Loop, near Union Station and the Ogilvie Center, so that Metra commuters could pick up bikes to pedal to their offices. Although space was available to build the station in Metra’s new French Market, next to the Ogilvie Center, CDOT missed the boat on this opportunity as well. Separated bikeways, where cyclists are protected from cars by a curb or other physical barrier, are widespread in Europe and are becoming more common in U.S. cities. New York’s separated bike lane on Sixth Avenue, for example, has been a hugely popular experiment, but Chicago has yet to try this idea. Automated bike rental has been commonplace in Europe for years. Paris’ Velib system, with 20,000 bikes at rental kiosks all over town, is credited with doubling the modal share for cycling. Chicago has been talking about this idea for years and in 2007 Mayor Daley rode a Velib bike in Paris. But Washington D.C. beat us to the punch two years ago, Denver now has 500 automated rental bikes and Minneapolis will be getting 1,000 this summer. Chicago is finally piloting a bike-share program this July, but once again we’re thinking small, with only 100 bikes in six Loop locations. But perhaps the most frustrating example of Chicago being the first to come up with a good idea for cycling but the last to implement it is the Bloomingdale Trail. As early as 1997, planners proposed turning the little-used Bloomingdale elevated rail line on the Near Northwest Side into a multi-use path and the Chicago Plan Commission committed to the idea in 2004. Although the rugged, now-abandoned rail bed is already getting plenty of illegal use from cyclists, joggers and squatters, the city seems to be dragging its heels on renovating the structure and opening it to the public. It’s unlikely to open until the end of this decade. Meanwhile, New York’s elegant High Line “vertical park,” a similar project that wasn’t officially proposed until 1999, debuted last year to huge acclaim—it’s already had millions of visitors. As a follower, not a leader, in all these different categories, it’s no wonder Chicago dropped in Bicycling magazine’s ranking of the best large U.S. cities for biking, from first place in 2001 to tenth place in 2010. It’s not that things are bad here, it’s just that more exciting stuff is happening more quickly elsewhere. Active Trans will be hiring a new director soon, and it will be interesting to see if this person can light a fire under CDOT and other departments to make some of the above projects happen sooner than later. But again, Active Trans can only push so hard, because the advocacy group depends on the city for consulting dollars. Unlike in liberal, temperate West Coast cities where bicycling has long been popular and politicians have responded to demands from the public for better bike facilities, cycling in Chicago has traditionally been a “top-down” affair. Under Daley, the city has installed paths, lanes and racks in an effort to coax people out of their cars. But now that Chicago cycling has gained momentum while CDOT’s bike initiatives have lost steam, it’s time for a “bottom-up” approach. Citizens need to start pressuring City Hall to put the mettle to the pedal. It’s worked before. After seriously injuring herself when she wiped out on one of Chicago’s dangerous metal-grate bridges, in 2002 Kathy Schubert launched a letter-writing campaign demanding that the bridges be made safer for cyclists. The campaign infuriated then-CDOT Commissioner Miguel d’Escoto, but after receiving dozens of postcards, he ordered the Bicycle Program to start working on the problem. Eventually metal plates were installed on bridges at Wells and Cortland. The Bike 2015 Plan, released in 2006, calls for the establishment of ten miles of “bike boulevards,” traffic-calmed, residential streets where cycling is encouraged because cars are forced to slow down, common in Portland, Oregon, Berkeley and other cities. Last fall Sarah Kaplan grew frustrated that little action had been taken on this proposal. She formed the grassroots group Bike Boulevards Now! to lobby the city to get moving on the idea. CDOT Bicycle Program Coordinator Ben Gomberg now says he’s hoping to establish Chicago’s first bike boulevard by 2011. If you want Chicago to remain a first-class bicycling town, contact your alderman, CDOT, or the Mayor’s Office to demand that the city starts implementing big plans for biking—now. Tell them you want immediate action on exciting projects like separated bikeways, on-street bike racks, a new bike station, a large-scale bike-share program, city-funded ciclovias and the Bloomingdale Trail. Or, better yet, form your own grassroots group, recruit members via the Chainlink, and start organizing for change. It’s time to put the rubber on the road.